On the day of your procedure, please refrain from wearingeye makeup, perfume, cologne or aerosol hair products. The laser is sensitive to these products and they could alter your treatment. Please arrive at your scheduled appointment time and check in with the front desk staff. We will request the contact information of the driver who is to bring you home after surgery. They will be called 10 minutes prior to your completed procedure. You can expect to be at our clinic for approximately two hours. Please bring all the information that you received at your LASIK evaluation appointment, including your filled prescription eye drops. Anesthetic and antibiotic eye drops will be placed in your eyes. Each eye will be cleansed prior to your procedure. Our staff will review your post-operative medication instructions. Upon entering the laser treatment room, you will be asked to lie back in the laser chair in a comfortable position. Another anesthetic eye drop will be administered at this time to ensure you don’t feel any sensation during treatment. Once you are comfortable, the doctor will ask you to fixate your vision on a small light. The entire procedure will last approximately five minutes per eye. You may hear a ticking sound or notice a burning smell as the laser works; do not be alarmed. Following your procedure, you will be escorted out of the laser room and your blood pressure will be taken. You will also receive your post-operative pack, which contains medications, instructions and your protective eye shields to be worn while sleeping. Once your blood pressure is determined to be stable you will be released to your driver. Once you leave the Schwartz Laser Eye Center, you should go directly home and sleep for a minimum of four hours. Sleep speeds up the healing process and makes the initial period after your procedure more comfortable. We recommend you take a sleeping aid, such as Tylenol® PM (not to exceed recommended dosages). It is not uncommon for your eyes to feel scratchy and watery. These are normal side effects and only temporary. Do not rub or touch your eyes under any circumstances. You will need to wear protective shields whenever you sleep for the next four days. 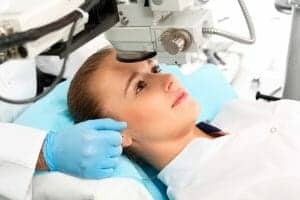 For more information about what to expect on the day of your LASIK surgery, don’t hesitate to contact the team at Schwartz Laser Eye Center. Please call us at 480-483-EYES (3937) or 888-553-EYES, or send us an email today.